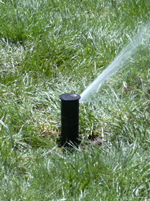 Remember: your sprinkler system spends your money at two o'clock in the morning. It should be throughly inspected every year to ensure that your system operates at peak effeciency. Our comprehensive service includes setting your controller, checking your sprinkler heads alignment, clearing clogged nozzles, and repairing any damaged components. What does the maintenance agreement include? Each year we service the system twice. You are billed every August for yearly maintenance. This payment includes two service calls - Fall winterizing service, and Spring startup. Any repairs required in the Spring are billed separately, except for items covered under warranty. Fall winterizing begins in early October, starting in the northern part of the state (Cumberland area) and moving to the southern part (Westerly area) by November 15. We blow out the lines using a high pressure air system. This service accounts for 40% of your yearly maintenance fee. Spring startups begin in early April, starting in the southern part of the state (Westerly area) and moving to the northern part (Cumberland area). This process avoids possible freezing of the lines once the system has been started up. This service accounts for 60% of your yearly maintenance fee and includes an evaluation of the entire system. We check each sprinkler for movement, clear clogged nozzles, check electric valves, review programming on your controller, check for leaks and damage, and check the rain sensor. During the startup period, any damage, leaks, or other problems will be flagged. The technician will take a time check at this point so you are only billed for any extra time used and parts needed to make the repairs after startup procedures have been completed. REPAIRS ARE NOT INCLUDED IN THE YEARLY MAINTENANCE FEES. Our Limited Three Year Warranty: Parts are warranteed for three years from system installation. The first full year from the time of installation is covered 100% - parts and labor - for any manufacturer defects or design problems with the system. It does not cover homeowner and/or natural disaster damage. If a part fails in the second or third year from time of installation, the part is covered 100%, the service call and labor are not included. The service agreement does not cover extra service calls throughout the season, except as described above. What is the yearly service rate? The charge for this yearly maintenance agreement is very reasonable and based on the number of sprinklers to be serviced: Systems of 20 sprinklers or less are $140 yearly, with an additional $2.25 charge per sprinkler over 20. For more information on our service program, please call the office at (401) 828-1116.